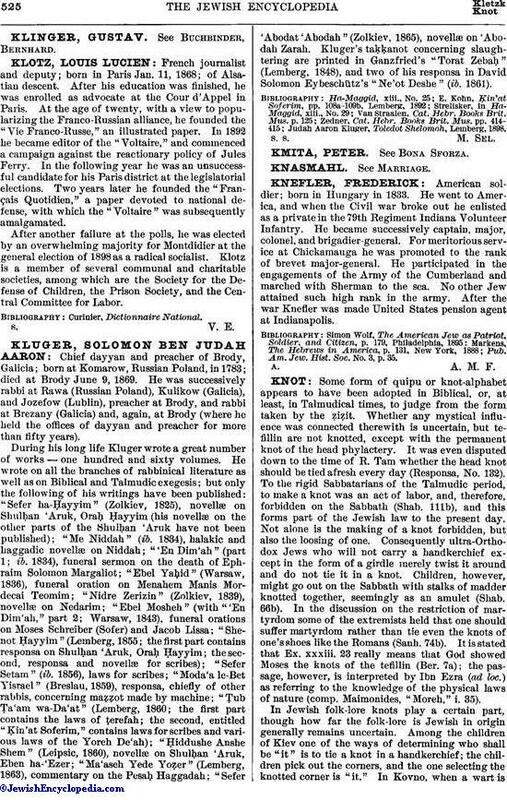 Chief dayyan and preacher of Brody, Galicia; born at Komarow, Russian Poland, in 1783; died at Brody June 9, 1869. He was successively rabbi at Rawa (Russian Poland), Kulikow (Galicia), and Jozefow (Lublin), preacher at Brody, and rabbi at Brezany (Galicia) and, again, at Brody (where he held the offices of dayyan and preacher for more than fifty years). During his long life Kluger wrote a great number of works—one hundred and sixty volumes. He wrote on all the branches of rabbinical literature as well as on Biblical and Talmudic exegesis; but only the following of his writings have been published: "Sefer ha-Ḥayyim" (Zolkiev, 1825), novellæ on Shulḥan 'Aruk, Oraḥ Ḥayyim (his novellæ on the other parts of the Shulḥan 'Aruk have not been published); "Me Niddah" (ib. 1834), halakic and haggadic novellæ on Niddah; "'En Dim'ah" (part 1; ib. 1834), funeral sermon on the death of Ephraim Solomon Margaliot; "Ebel Yaḥid" (Warsaw, 1836), funeral oration on Menahem Manis Mordecai Teomim; "Nidre Zerizin" (Zolkiev, 1839), novellæ on Nedarim; "Ebel Mosheh" (with "'En Dim'ah," part 2; Warsaw, 1843), funeral orations on Moses Schreiber (Sofer) and Jacob Lissa; "Shenot Ḥayyim" (Lemberg, 1855; the first part contains responsa on Shulḥan 'Aruk, Oraḥ Ḥayyim; the second, responsa and novellæ for scribes); "Sefer Setam" (ib. 1856), laws for scribes; "Moda'a le-Bet Yisrael" (Breslau, 1859), responsa, chiefly of other rabbis, concerning maẓẓot made by machine; "Ṭub Ṭa'am wa-Da'at" (Lemberg, 1860; the first part contains the laws of ṭerefah; the second, entitled "Ḳin'at Soferim," contains laws for scribes and various laws of the Yoreh De'ah); "Ḥiddushe Anshe Shem" (Leipsic, 1860), novellæ on Shulḥan 'Aruk, Eben ha-'Ezer; "Ma'aseh Yede Yoẓer" (Lemberg, 1863), commentary on the Pesaḥ Haggadah; "Sefer 'Abodat 'Abodah" (Zolkiev, 1865), novellæ on 'Abodah Zarah. Kluger's taḳḳanot concerning slaughtering are printed in Ganzfried's "Torat Zebaḥ" (Lemberg, 1848), and two of his responsa in David Solomon Eybeschütz's "Ne'ot Deshe" (ib. 1861). Judah Aaron Kluger, Toledot Shelomoh, Lemberg, 1898.